We make finding grants easy! Using Quick Search allows you to incorporate keywords, geographic location (by state and/or U.S. territory), and subject headings - or a combination of these three categories - to find funding opportunities quickly and efficiently. 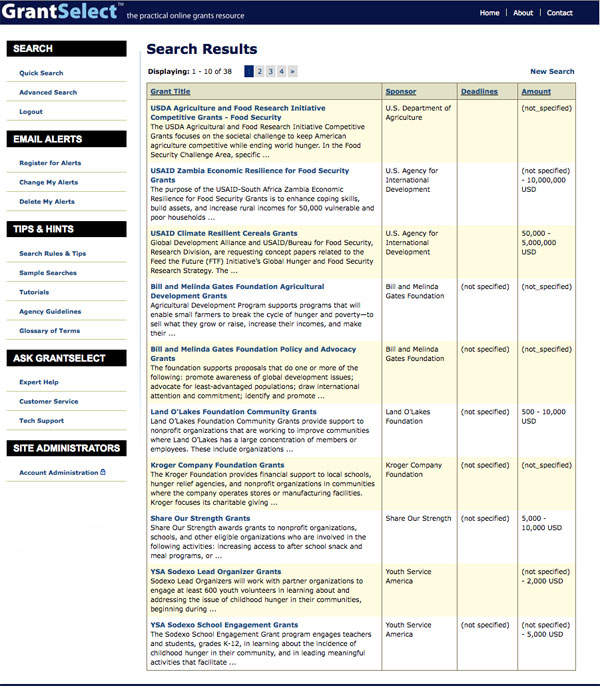 As you can see from the enlarged screenshot image on the left, a sample search might include "hunger" as a single keyword and "Indiana" as a single geographic location. The keyword field searches the entire database, and each keyword added (without Boolean expression) will broaden the search results. This same result of broadening your search can be accomplished by adding more geographic locations or subject headings. If you would like to narrow your search using additional keywords, you can do so by simply placing a "+" sign immediately in front of each word (e.g., food +pantry) that you add. These are just a few examples of the literally thousands of combinations that can be searched using this Quick Search category. Search results from the Quick Search example above provide a number of funding possibilities that meet your criteria and deserve further investigation. In the example above, with "hunger" as a single keyword chosen and "Indiana" as the single geographic location chosen, you would see more than three dozen funding possibilities. 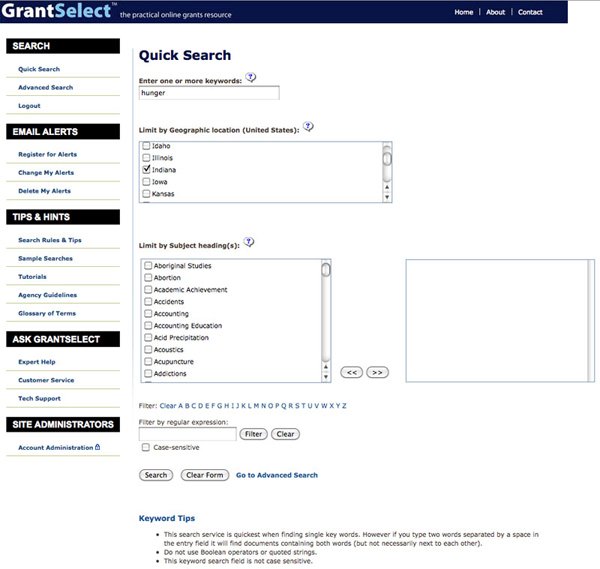 To display additional search results from this list, simply click on the page numbers above the Grant Title heading. This number of matches might continually fluctuate from one day to the next, as new opportunities are added to the database. 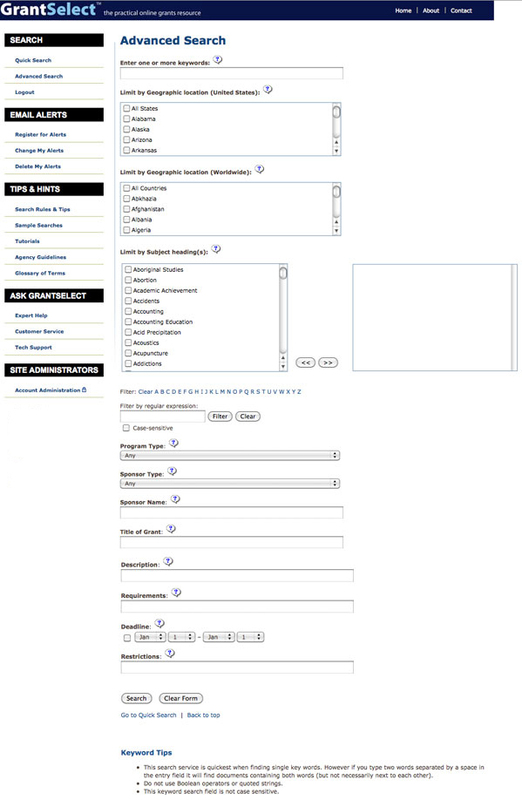 As you can see from the enlarged screenshot on the left, funding possibilities are displayed in groups of ten, with each grant title followed by a brief description, the sponsor name, and any deadlines or amounts that might have been specified by the funder. Each of these categories (Grant Title, Sponsor, Deadline, and Amount) can then be sorted alphabetically or chronologically. As you can also see, grants only for residents of other states, e.g. Texas, do not appear in the search results. Once you find a funding possibility that deserves further scrutiny or evaluation, the next step is to simply open the entire funding detail. This can be done by clicking on a unique Grant Title. From the enlargement of the example on the left, you will see a significant amount of information. Just below the grant title you will find the sponsor info, which offers sponsor name, address, website (if available), and the sponsor type. Sponsor type can be corporation, federal, foreign, foundation, nonprofit, professional organization, research group, state government, university, or Canadian organization. 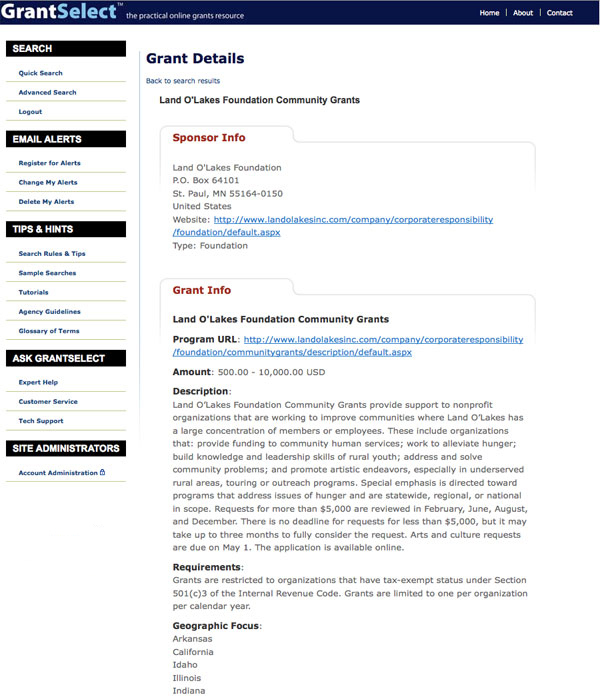 Below the sponsor info you'll find the grant program URL, amount range, the complete description, requirement that qualify the applicant, geographic focus of the funder, restrictions, a sampling of past grants (if available), and specific contact information of the program officer. Further down, you'll see additional pertinent information, including deadlines and other key dates (if specified), program types, subject headings, and target populations (if identified). Each of these categories will help you to align your funding needs with the mission of the funding organization. Aside from a Quick Search, GrantSelect allows you to conduct a more thorough search by incorporating its Advanced Search features. Studying the enlargement of the image on the left, you'll find each of the search features discussed above. 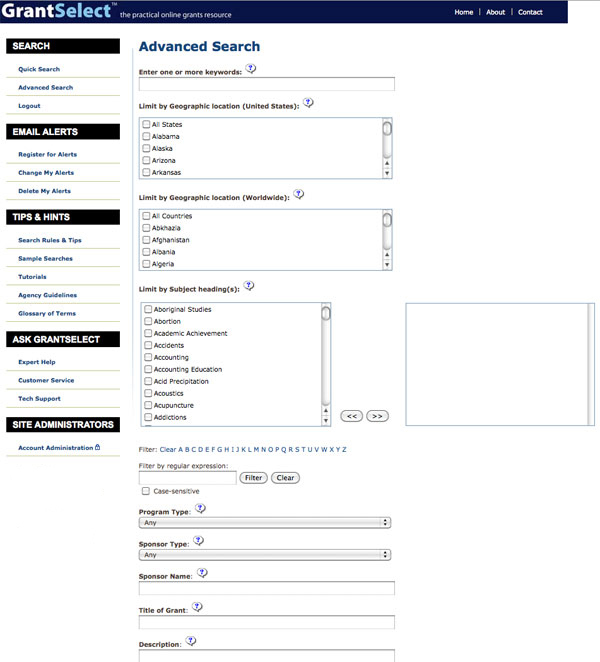 Beyond the Quick Search categories detailed above, which included keywords, geographic location, and a list of subjects, you are able to narrow the results by using a number of other fields. Program type, for example, allows you to specify a single program that you are attempting to fund, including everything from basic research to education, seed grants, curriculum development, and career training. A single sponsor type can also be selected if you are interested in locating federal funding instead of corporate support. If you are in search of a particular sponsor or grant title, the Advanced Search features allow you to type these in their respective search fields. If a particular requirement or restriction is of interest, simply type in terms that you hope to find in your search. And, finally, you even have the unique ability to specify a particular deadline range in preparation for a tight timeline. There is no single perfect combination of search fields that works for everyone. You should, instead, test each of these parameters to discover what will provide you with optimal results.